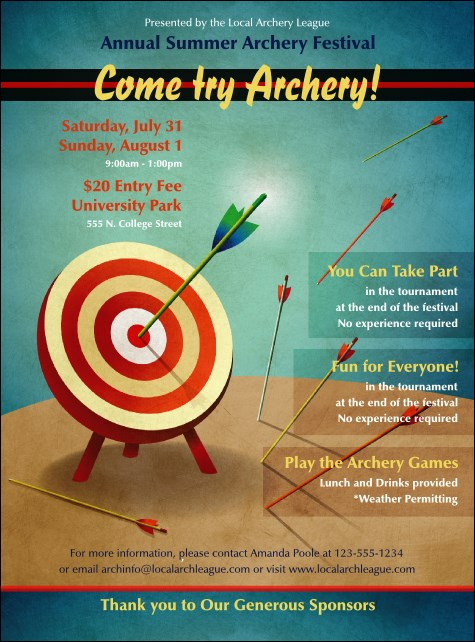 Get right to the point when you use the Archery Flyer to promote your event. The spirited styling features a bright blue backdrop, a field of flying arrows and a target of red, orange, cream and white with a blue and green arrow set dead-center. There's no need to skimp on event information with 23 lines available to customize. Easily create the right flyer for every occasion at TicketPrinting.com!